The majority of the engineer’s buyer journey has moved online. Engineers valued Google as the most valuable content resource, followed by vendor websites. Nearly all engineers prefer to do online research and evaluate vendors before talking to sales. Most engineers have between three and seven interactions with a company before talking with its representative directly. 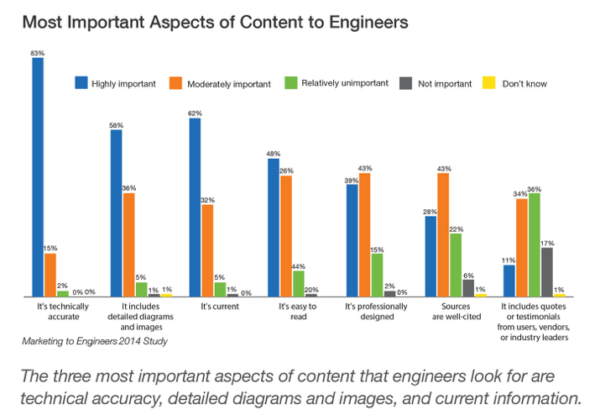 Most engineers are more likely to do business with a company that regularly produces new and current content. 1. Ensure that content is technically accurate, current, and includes detailed diagrams and images. 2. Have a technical expert at your company author it because technical experts trust other technical experts. 3. Craft case studies, as that’s the content type technical professionals value most. Engineers and other technical professionals are risk-averse and want to stay with the herd. Reference the experience of others whom they perceive to be similar. They want to hear about the challenges your customers faced, and how your products and services helped them solve those challenges. Ask for permission and include verbiage to use the customer’s experience for a case study when the contract is signed. Invite your customer to join your event or webinar to share how they overcame challenges and succeeded. It gives them a chance to shine and you can turn the presentation into a case study. If your customer won’t consent to a case study, publish what I call an “unbranded” case study, a short overview of the challenge and solution without mentioning the customer by name. While this is not as effective as a fully branded case study, it can be valuable if it includes sufficient credible, technical descriptions. 4. Create customer-centric content that resonates with your specific technical buyer personas. What are your prospects’ biggest pain points? What tough questions do your customers consistently ask your sales engineers? What are the top three to four questions most relevant to your application focus areas? What are the business risks associated with the application areas you work in and what can you share about how to mitigate these? What gaps in the market can you educate your prospects about? What does your company do better than your competitors that your prospects need to know about? 5. Make sure your content has great headlines – good headlines are not enough. Because engineers’ most valued content source is Google, your content must stand out from the pages and pages of search results competing for your buyer’s click. Engineers go deep into search results – 30% go through four to 10 pages of results, and more go through 10-plus pages. You will win that first click with an effective and relevant content’s title and meta description (10- to 15-word description). Engineers interact with e-newsletters in a similar way. The majority of those surveyed told us they scan for subject lines that intrigue them and delete the rest. Content planning, development, and marketing is hard work for any market. With technical audiences who are skeptical, data-driven, risk-averse, and who want to hear from experts, your job as a marketer is exponentially tougher. But if you understand the unique attributes of this audience – and respond to those nuances – your content will keep you in the game of attracting and engaging technical buyers. 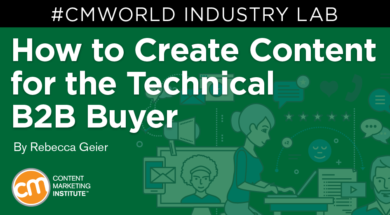 Spend the day learning more about reaching technical audiences with content that sticks at the Industrial Manufacturing Lab Sept. 8 at Content Marketing World. Register today for the lab. Haven’t signed up for the main conference? Register now and use code BLOG100 to save $100.